The US is engaged in talks with the Taliban, Afghan President Hamid Karzai has said, in the first high-level confirmation of US involvement. Mr Karzai said that "foreign military and especially the US itself" were involved in peace talks with the group. Hours later, suicide bombers attacked a Kabul police station, killing nine. Earlier this month, US Defence Secretary Robert Gates said there could be political talks with the Taliban by the end of this year. The US is due to start withdrawing its 97,000 troops from Afghanistan in July. "In the course of this year, there have been peace talks with the Taliban and our own countrymen," Mr Karzai told a Kabul news conference on Saturday. "Peace talks have started with them already and it is going well. Foreign militaries, especially the United States of America, are going ahead with these negotiations." The heart of Kabul was a battleground. Suicide bombers attacked a police station just half a mile from the presidential compound where, hours earlier, President Karzai was talking about hopes for peace. Talks with the Taliban have started. These though are just contacts, talks about talks, rather than substantive negotiations. Quick results are unlikely. Nato, the Afghan government and the Taliban themselves all expect another summer of hard fighting and probably many more. If President Karzai is right though, it appears that one important thing has changed - the Taliban have always maintained that they would not negotiate until foreign troops left. It seems that position is starting to soften. He gave no details as to whether the discussions involved Taliban officials with US authorities, or a go-between. Shortly after the announcement, a number of suicide bombers attacked a police station near the finance ministry in the Afghan capital. The interior ministry said there were three bombers, but other officials said there were four. The Taliban said they carried out the attack. The Afghan interior ministry said nine people were killed: five civilians, three police officers and one intelligence official. Twelve people - 10 civilians and two police - were also injured. The attack has now ended. One of the bombers detonated his suicide vest, while two others were shot dead by police. Some reports said a fourth bomber was killed in an exchange of fire with security forces. 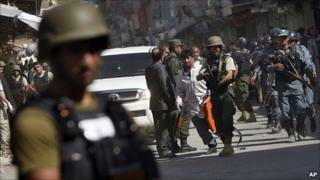 The BBC's Paul Wood in Kabul says the attack is part of the Taliban strategy to strike at the heart of government. Paradoxically, he says, the greater the likelihood of peace talks, the more Nato and the Taliban will press their military campaigns in a bid to ensure they go into negotiations with an advantage. Meanwhile, insurgents attacked two convoys supplying Nato troops in the eastern province of Ghazni, police said. Four Afghan security guards escorting the trucks were reportedly killed by roadside bombs. The Taliban's official position regarding peace talks is that it will only negotiate once international forces leave Afghanistan, and that it will only talk to the Afghan government. Diplomats have previously spoken of preliminary talks being held by both sides in the continuing conflict. A US state department spokeswoman in Washington said she had "no comment" on Mr Karzai's statement, but added the US had consistently supported an Afghan-led process of reconciliation". "Currently, we have a broad range of contacts across Afghanistan and the region, and at many levels, to support that effort," spokeswoman Megan Mattson told Agence France-Presse. The UK said it supported "Afghan-led efforts to reconcile and reintegrate members of the insurgency who are prepared to renounce violence, cut links with terrorist groups, and accept the constitution". "In view of the death of Osama Bin Laden, it is time for the Taliban/insurgency to positively engage in the political process," said a statement from the Foreign and Commonwealth Office. Col Richard Kemp, a former commander of British forces in Afghanistan, said there was currently no prospect for successful peace talks with the Taliban. "The only possibility that could happen is if they as a movement are defeated and there's no prospect of that happening in the near future." He said the objective of international forces in Afghanistan should be to encourage malleable elements of the Taliban to split away from the hard-core leadership of Mullah Mohammad Omar, thereby weakening the group. On Friday, the UN split a sanctions blacklist for the Taliban and al-Qaeda, to encourage the Taliban to join reconciliation efforts. Before now, both organisations have been handled by the same UN sanctions committee. The UN Security Council said it was sending a signal to the Taliban that now is the time to join the political process. The Taliban ruled Afghanistan before being driven from power by US-backed forces in 2001. It had sheltered al-Qaeda and its leader, Bin Laden.